LEAD - Participants - Phase III - Sigma Nu Fraternity, Inc. Welcome to the resource library for Phase III participants. The following information provides a deeper dive into each of the topics from this phase, including: topic primers, project descriptions, and reflection activities. Expand the sections below to view topics in Phase III: The Light of Truth. As you are well aware, Phases I and II focused on giving Candidates and second year members a foundation of knowledge regarding Sigma Nu, ethics, values, leadership, and teamwork as well as the growth of the individual in terms of understanding their own personality, leadership style, and the impact they can have on the chapter. With this foundation, we believe Sigma Nu is giving members and Candidates the experiences and knowledge they need to be positive and productive members of Sigma Nu, the college/university, and local community. Phase III is designed to further the knowledge and experiences created in Phases I and II, but more specifically, Phase III is about application. As a Phase III participant, you and your chapter will benefit through individual and group growth of your fellow Phase III participants. An additional benefit to your participation in Phase III is that you and your participating brothers will be positioned to deepen your understanding of the foundational concepts of LEAD by applying them on your campus and in your community. Phase III is focused on exercising the skills and experiences you have already gained in the chapter. You will also find that the experiences and relationships you take away in Phase III will serve you well after graduation. Put simply, Phase III focuses on building a better understanding of what it means to be a brother and the result is a better Sigma Nu experience for you and your chapter. Like Phases I, II and IV, each session of Phase III is composed of multiple parts. First, you will want to review the information found here in the LEAD online resource library. The purpose of this online reference material is to infuse a foundation of knowledge on the topic covered in each respective session. Each session begins with an online primer for the topic being covered in each the module. However, unlike the other phases of the LEAD Program, this foundational knowledge is followed by a listing of projects to be completed by individual participants. Once you review the primer information and project listings, choose the projects that are most appealing to you. As you complete the project(s) for each module, revisit the online resource library to complete the reflection exercises. These reflection exercises will be a valuable component of processing your experience, both individually and with your cohort as a part of group meetings. Completion of a Phase III module includes reviewing the online topic primer and selecting the projects to be completed in the “leadership lab.” Regularly throughout the semester, quarter, or year, you should meet as a group with your Phase III cohort and LEAD Coach/Advisor. These meetings should take the form of an open discussion on the modules completed to that point, the project experiences of the members, and a reflection of how those experiences impacted individual participants. In the end what can you and your chapter expect from participating in Phase III? In the simplest of terms, a more complete fraternity experience, an experience ripe with ethical leadership and a stronger brotherhood. Congratulations on making the commitment to participate in Phase III. This commitment signifies not only your commitment to Sigma Nu, but also your desire to further improve yourself but your chapter as well. Since each module includes projects to choose from – and participants are unlikely to select all of the same projects – you’ll benefit from sharing with and learning from your brothers about most of the project experiences while only being personally responsible for completing a portion of the total project library. Your LEAD Chairman will put together the timetable for completing specific modules and coming together as a group to discuss individual progress and experiences within the program. To assist in the planning and discussion of Phase III, the chapter should enlist the assistance of a LEAD Coach or Advisor. Depending on your chapter, this individual may be an alumnus, faculty/staff member, or other volunteer. The LEAD Coach/Advisor’s role is to act as a mentor for the chapter’s overall LEAD program, and to guide discussion amongst the Phase III cohort during their meetings. Click here for descriptions of what to expect in each module. Phase III is the Fraternity’s leadership development program for third-year members. Using the Phase III “Leadership Lab” approach, participants will apply what they have learned to situations on their campus and in their community. In essence, individual participants will take ownership for their own learning journey. In addition to self-paced activities, they will meet with other Phase III participants – their cohort – three to four times each quarter or semester. During this time, they’ll share successes and brainstorm ideas to address the challenges they are facing as they work through each module’s projects. The Phase III “LEAD Coach” – an alumnus, faculty/staff member from the institution or other volunteer– will help the group process their experiences and act as a resource to all participants. What should participants expect to get out of Phase III? Phase III offers an opportunity to put into practice the knowledge and skills developed throughout Phases I and II. This phase takes a “Leadership Lab” approach that drives participants to refine their skills while benefiting their university, Greek, and local community. What will I get from participating in Phase III? How much time does Phase III take? Phase III is designed to take advantage of what you are currently involved in on campus and in the community. Because of this structure, you can use your participation in organizations as your “Leadership Lab.” The time required to participate in Phase III is at least three hours a month – 10-20 minutes to review online resource material about that month’s topic, approximately 60 minutes for a cohort meeting, and the remainder working on the project(s) for that month’s module(s). Of course, you can schedule more time if you’d like. It’s up to you. How is Phase III organized? There are seven modules included in Phase III. The modules focus on organizational and personal development and address specific focus topics. You will have the opportunity to select how you will apply your learning from each topic by choosing a specific project or projects. The projects differ in their complexity and time required for completion. Within each module you will be able to choose which project(s) you feel will provide the best learning experience for you. As part of the online resource material, each of the focus topics has a primer which gives you background information about the topic area. This will help build your foundation of knowledge so you can be successful. A list of resources, including websites, books and articles, and other sources where you can learn more about each topic has been provided. What is the purpose of a LEAD Coach? The LEAD Coach is an alumnus, faculty/staff member, or other volunteer that serves as a member of the LEAD Committee and is responsible for Phase III of the program. In this role, the Coach works with the LEAD Chairman to create a schedule for module and project completion as well as cohort meetings. During cohort meetings, the LEAD Coach serves as a discussion moderator. Throughout the year, the Coach serves as a resource to Phase III participants in selecting and completing projects, identifying group projects and as a general mentor. Why did the Fraternity create Phase III? We believe that the third year in school is a time to take advantage of your experiences in organizations you are involved with on campus. In most cases, you are fully immersed in the campus environment and involved in several campus organizations. By applying what you’ve learned through LEAD to situations you are facing in other organizations, you will increase your understanding of key leadership practices and gain more confidence in your abilities. Phase III module topics include: Organizational Development, Personal Development, Effective Change, Career Development, Social Change, Ethics, and Problem Solving. What is the schedule for Phase III? Each term (semester/trimester/quarter), you will focus on several modules. To help keep you on task, sample schedules for the academic year have been provided in this manual. These samples are just a guide though. We expect you to take ownership for your learning experience and adjust the schedule as appropriate and based on your time commitments. Your LEAD Coach will help guide your cohort through the process and organize your cohort meetings. Who can participate in Phase III? Phase III was designed for chapter members who are in their third year of school and have completed Phase II. However, Phase III could be used by seniors in year four of a five-year program, advanced sophomores, or anyone that has a strong desire to participate. What is the minimum number needed for my chapter to utilize Phase III? The minimum number of Phase III participants to get the program started is two. Multiple participants are needed for the cohort meetings to be optimally effective. Any chapter member or alumnus can access the online resource materials and review the primers and project options. Welcome to Phase III of the LEAD Program! We congratulate you on your commitment to continued learning and self-improvement. Phase III takes a “leadership lab” approach, where you will apply what you’ve learned to real life situations on campus and in the community. Phase III is primarily a self-paced program. You will take responsibility for initiating a project in each of the seven modules. Periodically, you will come together with other Phase III participants (your cohort) to share your experiences. Your cohort will also have a LEAD Coach – a local alumnus, staff/faculty member, or other volunteer – to help guide you through the process. As you have seen in Phase I and Phase II, taking responsibility for your learning means being prepared, ready to participate, willing to offer ideas and open to new ideas. Phase III takes your learning to the next level. Best of luck as you begin this exciting program! Executive Director, Sigma Nu Fraternity, Inc. It is our hope that this into has given you an idea of what you can expect during your participation in Phase III. If you find yourself feeling unsure, or if you don’t understand why a topic or specific project has been included in this phase we ask that you trust the process. Phase III has been put together specifically to help you and your chapter improve and the modules of Phase III will do just that, if you trust the process. How have you changed during your time in Sigma Nu? What skills have you gained thus far through your involvement with Sigma Nu? How have you used the skills and experience gained through your involvement with Sigma Nu to positively impact other organizations in which you are involved? In what ways can you show the value of your Sigma Nu experience in your interactions with other individuals and organizations? The world is constantly changing. The immediate priorities of society constantly shifting back and forth between what is important today and what will be important tomorrow. To remain relevant, all organizations must evolve to meet the ever-changing challenges that threaten organizational existence. Those that fail to evolve often find themselves hanging a “going out of business” sign on their front door. To avoid such a fate, organizations must be flexible, willing to evolve, and to expand their capacity if they are going to realize the results they desire. In short, organizations must continually develop the means by which they fulfill their mission. According to Warren Bennis, founder of The Leadership Institute at the University of Southern California, and widely regarded as a pioneer in the contemporary field of Leadership Studies, organizational development is a complex strategy intended to change the beliefs, attitudes, values and structure of organizations so that they can better adapt to new opportunities and challenges. It is a long-range effort to improve an organization’s ability to solve problems and address its processes. Specifically, effective organizational development is a collaborative effort in recognizing and implementing effective change in an organization. Those organizations that are able to take the necessary steps to make effective changes to their culture, as well as their operations, will, consequently, increase their capacity to achieve their goals. In effect, they become learning organizations. An organization’s ability to “keep up” – to transform into a learning organization – is heavily based on its ability to secure peoples’ commitment and tap into their capacity to learn and collaborate regardless of their position in the organization. The organization must be able to recognize when its desired outcomes have deviated from its initial direction and it must take the necessary steps to correct this mismatch either by adjusting its desired outcomes or by restructuring its direction. Senge offers five theories and methodologies by which an organization can achieve these learning capabilities. Systems Thinking – the fifth discipline that integrates the other four; its essence lies in a shift of mindset – seeing interrelationships rather than linear cause-effect relationships and seeing processes of change rather than snapshots. A core aspect to organizational development is the existence of a catalyst or agent of change. There are times when this catalyst may be an event that dramatically effects the organization, but most often the change agent is a person, or group of persons, familiar with the organization. A change agent does not have to be a member of the organization, nor do they have to be an external influence. In other words, a catalyst for change can come from anywhere. This is where you, the LEAD Phase III participant enter the picture. Your task to complete this module of LEAD Phase III is to complete one of the following projects. These projects will direct you to be a change agent and assist a student organization on your campus to move one step closer to becoming a learning organization. Review the Project Options and Project Details below to learn more. After completing your selected project, you are encouraged to take some time to reflect on the project and how the concepts of organizational development were applied. Then, share your thoughts and experience with the other Phase III participants and your chapter. The projects for this module are as follows in the listing below. Complete at least one from this listing. For this module, Phase III participants may pair up and work together to complete any of the projects below. Facilitate a workshop on teambuilding for a student organization on campus. Facilitate a workshop on goal setting for a student organization on campus. Facilitate a retreat for an organization’s Executive Board. See the sections below for more information and resources to assist with each project. Once you have finished the project, complete the corresponding reflection exercise in preparation for meeting with your Phase III cohort and LEAD Coach/Advisor. To assist a student organization in developing a more cohesive team concept amongst its members by breaking down barriers of individualistic desires and creating a sense of synergy and group success. Identify an organization that might be interested in having you facilitate a workshop on teambuilding. Talk to friends who are officers in other student organizations, Director of Student Activities, or the Fraternity/Sorority Advisor to identify possible organizations. Meet with the president of the organization to explain your intentions. Tell them about LEAD Phase III and that you would like to help their organization by facilitating a teambuilding workshop. Also, be sure to get some background information from them about the organization such as the make-up of its membership, purpose of the organization, and common issues faced within the group. You may also want to ask if it would be possible for you to sit in on one of their meetings to get firsthand experience of the group dynamic of the members. Identify the themes the group would like to work on as part of the teambuilding experience (e.g. communication, conflict resolution). Pair those with relevant teambuilding activities (see the Teambuilding Guide’s index of activities by theme for ideas). Determine how long the group can dedicate to the teambuilding experience (e.g. 30, 60, 90, 120 minutes). Identify the appropriate number of activities to conduct based on this timeframe. Set a time, date, and location for the workshop to take place. Gather the materials you will need for the workshop. Be sure you are prepared. Take some time to review facilitator notes and the instructions and rules of the teambuilding activities you plan to facilitate. Answer the reflection questions for yourself, in preparation for the cohort meeting on this module. Some Sigma Nu manuals and guides require a password for access. Ask your LEAD Chairman for the password if you don’t already know it. To assist a student organization in establishing effective goals that are reflective of the organization’s desired direction and outcomes. To create a sense of group commitment to the desired outcomes and direction of the organization. Identify an organization that might be interested in having you facilitate a workshop on goal setting. Talk to friends who are officers in other student organizations, Director of Student Activities, or the Fraternity/Sorority Advisor to identify possible organizations. If another student organization is not a good fit, this project could also be done with an existing chapter committee. Meet with the president of the organization to explain your intentions. Tell them about LEAD Phase III and that you would like to help their organization by facilitating a goal setting workshop. Also, be sure to get some background information from them about the organization (e.g. number of members, mission, vision, current projects in progress and challenges the organization is facing). You may also want to ask if it would be possible for you to sit in on one of their meetings to get firsthand experience of the group dynamic of the members. Gather the materials you will need for the workshop. Be sure you are prepared. Take some time to review facilitator notes, including activity instructions, materials, and discussion scripts. Facilitate the goal setting workshop. LEAD Session facilitator notes require a password for access. Ask your LEAD Chairman for the password if you don’t already know it. To facilitate the transition of elected leadership in an organization and to help identify needed changes to match desired outcomes and organizational direction. Identify an organization that might be interested in having you facilitate a workshop with their Executive Board. Talk to friends who are officers in other student organizations, Director of Student Activities, or the Fraternity/Sorority Advisor to identify possible organizations. If another student organization is not a good fit, this project could also be done with an existing chapter committee. Meet with the president of the organization to explain your intentions. Tell them about LEAD Phase III and that you would like to help their organization by facilitating a transition workshop. Also, be sure to get some background information from them about the organization (e.g. number of members, mission, vision, current projects in progress and challenges the organization is facing). You may also want to ask if it would be possible for you to sit in on one of their meetings to get firsthand experience of the group dynamic of the members. Gather the materials you will need for the retreat/workshop. Be sure you are prepared. Take some time to review facilitator notes, including activity instructions, materials, and discussion scripts. What did you learn about the organization? What group behaviors did you observe among the organization’s members? From your interaction with members of the organization, what do you feel are the group’s strengths? Areas for improvement? What did you learn/re-learn about facilitation from your experience? What aspects from your prior LEAD experience did you utilize in working with the group? How? Why? Let’s be clear on one thing right off the bat, personal development is not synonymous with self-help. Personal development is a much broader concept than self-help or self-development in that it involves other people besides you. It is an amalgamation of activities focused on improving identity, developing and refining skills, building human capital, enhancing quality of life, and fulfilling aspirations. In short, personal development is striving to fulfill your potential. The effect our personal development has on other people exists within the relationships we have with others. How we affect others has a reciprocal effect on ourselves. Consider the relationship that exists between a student and a teacher. If a teacher has a positive influence on a student, then the student will likely perform at a higher level. The resulting improvement is reciprocated to the teacher in the growth of their own self-confidence. The same is true if the teacher provides a negative influence on students. The reciprocated influence on the teacher is the risk of a decline in their self-confidence. In many ways, self-confidence is the differentiating factor between similar people – those with the same levels of knowledge and types of skills – who realize different results regarding the achievement of goals and aspirations. Henry Ford, founder of Ford Motor Company and father of the assembly line, is famously quoted as saying, “Whether you think you can or whether you think you can’t, you’re right.” Ford’s remark effectively reiterates the notion of self-confidence as a defining factor in the achievement of dreams and aspirations. Go a step further, though, and consider this quote at a deeper level. What motivates us to think we can do something? What motivates us to want to do something? Motivation is simply the reason a person engages in a particular behavior; that reason may be as material as a reward, as physical as a desire to minimize pain, or as philosophical as the fulfillment of a lifelong dream. Regardless of the specific reason, our motivation drives us toward something. Ask yourself this question, “Are the people who I consider to be effective, motivated?” Most likely your answer is yes. We tend to readily identify effective people as being motivated and rightly so, because they have a drive, a desire, to achieve their goals. What we don’t usually know is that these same people probably failed to fulfill their goals on the first try, but that did not stop them. Their drive to attain their ideal, their motivation, kept them going undeterred, and once they fulfilled that goal they wanted more; they had a hunger to achieve another goal. For these people, the achievement of a goal became habit, and like any habit, they began doing it without thinking about it. Take just a minute and think about how that would impact your life. Think about what your life would be like if the moment you achieved one goal you instinctively started pursuing another one, as if it were a habit. Imagine the possibilities of what you could achieve. In its simplest of definitions, a habit is a routine of behavior that is repeated on regular basis. Commonly, these behaviors occur subconsciously because habituation is an exceptionally simple form of learning. In this module, you are provided with three groups of projects. Each grouping takes on a different scope of personal development. The expectation here is that you complete two of the projects from Group A, one from group B, and one from Group C.
After completing your selected projects, you are encouraged to take some time to reflect on the projects and how the concepts of personal development were applied. Then, share your thoughts and experience with the other Phase III participants and your chapter. The projects for this module are as follows in the listing below. Complete at least two from Group A and one each from Groups B and C. Once you have finished the projects, complete the reflection exercise in preparation for meeting with your Phase III cohort and LEAD Coach/Advisor. Select at least two to complete. Select at least one to complete. Taking time to think about how you are improving as a leader is vital to your success. The Personal Leadership Development Plan will help you plan a roadmap for the next six months and set you up for success. Keeping a journal is a strategy to help you learn more about yourself as a person and as a leader. Take time each day to write about what happened as well as the challenges and successes you faced will help you to identify strengths and areas for improvement. Make a commitment to write in the journal every day. What motivates you? What helps you perform at your best? This project will help you learn more about motivation and how to keep your motivation at a high level. Read one or more of the following books and then share what you’ve learned by delivering a workshop on motivation for your chapter, executive committee, or Phase III cohort. The Johari Window is an exercise to help you work on your confidence and self-image. For more information about the Johari Window go to https://www2.usgs.gov/humancapital/documents/JohariWindow.pdf. Read the explanation of the Johari Window and complete the activity at the end of the workbook. Review the information found at the following sources to increase your knowledge of this process. Review the information below to learn more about the keys to effective public speaking. Review the information below to learn tips for effective writing. Review the information below to learn how to be more creative. Grand Chapter is Sigma Nu’s biannual legislative convention. For more information, visit www.sigmanu.org/grandchapter. Similar program options might include campus or local multi-day leadership programs. View at least 4 of the listed TED Talks on Leadership and make note of any points that spoke to you and what you are taking away from the message. What stood out to you from the videos? How will you apply what you’ve learned? Read Exploring Leadership: A Guide for College Students by Komives, Lucas, and McMahon. Check your local library or purchase the book at www.amazon.com. Learn more about Transformational Leadership by visiting the following web sites. What did you learn about yourself in doing these activities? What new skills or techniques did you discover? How have you improved in the past six months? What are your personal development goals for the next six months? What aspects from your prior LEAD experience did you utilize in working through this module? How? Why? Insanity was once defined as doing the same thing over and over again in the same way and expecting different results. Take a moment to consider this statement and compare it to your chapter. Have you ever heard someone in your chapter say, “We’ve tried this before” or “We’ve always done it this way?” The purpose of this module is to help you better understand and become more capable of creating effective change. It is important that you, as a leader, have the tools and knowledge to make positive, effective change happen. Why do you think some members of the organization reacted to the change idea the way they did? Was the change resisted? Why? What mistakes were made in the process? Looking back, what could have been done differently to make the change easier? More effective? What factors make it more likely that a change initiative will receive support? So how do we do this? How do we make effective change happen? In John Kotter’s book Leading Change – one of the most popular books on the subject – he shares a model for implementing change in organizations. It includes eight (8) steps and has been widely recognized as a great resource. The methods used in all change initiatives are based on one insight – change does not happen easily; you need to work on it and address all key areas. The first four steps help to melt down the status quo and steps five to seven help to introduce the new practices. The last step helps change stick. Creating a guiding coalition: Major change is difficult unless the top leaders in an organization are active supporters, but it goes beyond that. In successful change efforts, there is a group of people with a commitment to improve things and see the change effort through. The guiding coalition needs to include members that are respected, members that others listen to and members that have credibility in the organization/group. Developing a vision and strategy: Urgency and a strong group to guide the change efforts are essential but they are only part of what you need. The vision for what it will look like when the change is implemented is vital. Vision plays a role in producing change by helping to direct, align, and inspire others. Communicating the change vision: Have you ever heard of WIIFM? It stands for “What’s In It For Me?” Members need to see/know what’s in it for them and how they fit into the end picture for them to support change. You should talk about the change vision with members one-on-one, in groups, and with the organization as a whole. Empowering members for action: The implementation of change efforts requires action from many people. It is important that you tell members exactly what they can do to support the effort. If people know what is expected of them and how they can help, you are helping to empower them. Part of empowering others is to reward and recognize those who are supporters. Generating small wins: What is momentum? Why is it important to an organization’s success? Not only is it important for overall success, but it is vital in the change effort. Small wins are things that you can look to as proof that the change is taking hold and having a positive impact. Creating small wins is different from hoping they will occur. Look for opportunities to highlight small wins in the change effort! Consolidating gains: As Kotter warns, “Do not declare victory too soon.” Until changes sink deeply into an organization’s culture – a process that can sometimes take years – new approaches are fragile and subject to regression. Again, a premature declaration of victory kills momentum, allowing the powerful forces of tradition to regain ground. Anchoring the change in the culture: Change sticks when it becomes a part of what you do as an organization. Until the new behaviors are rooted in the organization’s culture, they are vulnerable. One way to help educate members is to show how the change has helped the chapter. Another is to educate new members on the organization’s history, including its challenges and why changes were made. In this module, your task is to complete one of the following projects. These projects will direct you to be a “change agent” and assist yourself and others on your campus in realizing positive, effective change. After completing your selected projects, you are encouraged to take some time to reflect on the projects and how the concepts of effective change were applied. Then, share your thoughts and experience with the other Phase III participants and your chapter. The projects for this module are as follows in the listing below. Complete at least one from this listing. Once you have finished the project, complete the corresponding reflection exercise in preparation for meeting with your Phase III cohort and LEAD Coach/Advisor. Lead a Change Initiative – Select an organization that you belong to and partner with other organization members to identify an area for change. Work through the change initiate during the semester/quarter. Coach an Organization Through a Change Initiative – Acting as a consultant, help coach another campus organization through an organizational change initiative. Facilitate a Workshop on Effective Change – Using the workshop provided in the resources for this module, facilitate a session on effective change for a campus organization. Case Study on Change – Review the case study for change that has been provided and answer the case study questions that are included. Be prepared to share the case at your next cohort group meeting. To assist a student organization in addressing areas of improvement to make it more effective at achieving its purpose and to gain experience in leading a change initiative. Identify an area for change in an organization of which you are a member. Identify other members in the organization to partner with in addressing an area for change. You can either attempt to get them to support he area for change that you have identified or work together to identify an area for change. Work through the change initiative throughout the semester/quarter. Note your progress each week as it relates to the “Eight Steps to Effective Change,” identified by John Kotter (referenced in the Primer for this module). To assist a student organization in addressing areas of improvement to make it more effective at achieving its purpose and to gain confidence in leading a change initiative. Identify an organization on campus that you would be interested in working with this semester/quarter. Contact the president of the organization and meet with them. Explain that as part of your participation in LEAD, you have the opportunity to assist an organization in a change effort. Ask he president about the organization (e.g. number of members, mission, vision, current projects, and challenges the organization is facing). Tell the president that if they are interested, you would like to work with their executive board/officers to help coach them through the change initiative. Meet with the executive board/officers. During this meeting share information about yourself, explain your participation in LEAD, and your desire to help them work though a change initiative. Share the Steps to Effective Change handout with the president and/or executive officers. Help them work through the Change Worksheet and commit to the change initiative. Plan to meet with the president or executive board/officers twice-a-month (20-30 minutes) to talk about the change initiative and work through any challenges they are facing. If face-to-face meetings are not possible, track their progress through email/text updates or phone calls. To assist a student organization in better understanding change initiatives and how to implement change more effectively. Identify an organization that you could work with to facilitate a workshop on Effective Change.. Talk to friends who are officers in other student organizations, Director of Student Activities, or the Fraternity/Sorority Advisor to identify possible organizations. If another student organization is not a good fit, this project could also be done with an existing chapter committee. Meet with the president of the organization to explain your intentions. Tell them about LEAD Phase III and that you would like to help their organization by facilitating an Effective Change workshop. Also, be sure to get some background information from them about the organization (e.g. number of members, mission, vision, current projects in progress and challenges the organization is facing). You may also want to ask if it would be possible for you to sit in on one of their meetings to get firsthand experience of the group dynamic of the members. Set a time, date, and location for the workshop to take place. Work with the organization’s president to announce and promote the session to their members. Gather the materials you will need for the workshop (i.e. facilitator notes – see below, flipchart, markers, pens, and handouts). Be sure you are prepared. Take some time to review facilitator notes, including activity instructions, materials, and discussion scripts. To identify and apply concepts of effective change to a “real life” scenario. Review the case study below and answer the case study questions. Be prepared to share your analysis/responses to the case study with your cohort group at the next meeting. Ultimate Office Products was an old, established, manufacturing company in the turbulent office products industry. Discount merchandisers and office product superstores were spreading rapidly around the country, alternating the traditional distribution channels once dominated by wholesalers and smaller retail stores. The growing power of the new superstores was forcing manufacturers to improve customer service. The traditional manufacturers were being challenged by new companies more willing to cut processes and use technologies favored by the superstores, such as electronic orders and billing. Ultimate Office Products was losing market share and products were declining. Richard Kelly was the Director of Information Systems, a newly created position in the company. When the CEO met with Richard to discuss his new responsibilities and objective, she explained that it was essential to speed up order processing and improve customer service. Richard knew that the order processing system used by the company was obsolete. He prepared a plan to automate the system and got approval for it from the CEO. Then, he purchased new computer workstations and a software package to support them. The software would enable customers to make electronic orders, and it would improve order processing, billing, and inventory control However, months after the equipment and software arrived they were still waiting to be used. The managers from sales, production, accounting, shipping, and customer service could not agree about the requirements of the new system, which was necessary to get it operating. These managers were Richard’s peers and he had no direct authority over them. Even though he encouraged cooperation, meetings among the mangers usually ended with heated accusations about who was responsible for the company’s problems. There was little agreement about the reason for the delays in filling orders, and some of the managers questioned the need for an expensive new system. Meanwhile, the CEO was becoming very impatient about the lack of progress. She made it clear that, after spending a small fortune on new technology, she expected Richard to find a way to resolve the problem. Richard decided it was time to take a different approach. His first step was to gather more information about the reasons for delays in processing and filling orders. He began by having his staff map the workflow from the time orders were received until the filled orders were shipped. As he suspected, there were many unnecessary activities and bottlenecks that could be eliminated to speed up the process. The problems extended across functional boundaries and required changes in all departments. The preliminary results were presented to the CEO, who agreed on the need for dramatic improvement and authorized Richard to begin reengineering the process. Despite having the support of the CEO, Richard knew that widespread commitment would be needed for major changes to be successful. Richard met with the department managers to get their assistance in forming some cross-functional task forces. Although he knew that one task force would probably be enough to determine what changes were needed, he wanted to involve more people in the change process so that they would understand and support it. An outside consultant was secured to advise the task forces in their work. Each task force examined a different aspect of the problem. They analyzed processes, met with key customers to learn what they wanted and visited other companies to learn how they processed orders more efficiently. As people began working together to understand the system, they began to realize how serious the problems were. The participants were able to put aside their functional biases and cooperate in finding ways to improve efficiency and customer service. Each team made recommendations to the steering committee, composed of Richard and the department managers. The CEO also attended these meetings to emphasize their importance. When one of the department managers opposed a change, everyone in the meeting looked to the CEO, who made it very clear that she supported the task force’s recommendation. Within a year, the company eliminated many of the steps formerly used to process an order, and the average number of days required to process an order was reduced by nearly half. Many more orders were being made electronically, and most mistakes in the billing process were eliminated. As people discovered that they could actually change things for the better, many of them volunteered to serve on teams that would continue to look for ways to improve quality and customer service. Why did Richard fail in his first attempt to implement change? Identify actions that Richard used in his second attempt that were more effective for implementing change. Evaluate the change leadership provided by the CEO. What did you learn about yourself in doing these activities? In your experience, what is necessary for real, lasting change to occur? Will you approach future change efforts differently? How? What do you want to do in your professional life? In what field do you want to work? Is there a particular place-company, city, state, country-where you want to live and work? In many ways, you probably already have answers to some in not all, of these questions, but what is your career plan? For most people, the days of working for one organization, doing virtually the same thing, your entire working life are gone. As society has continued to advance, the global workforce has become more migratory. Workers today are more willing to move to another town, state, or even another country, for employment. This growing willingness to move for work has also brought with it a willingness to explore new career paths. In the 1950s, changing careers was not a regular occurrence. Sure, a teacher might change schools, but they were still a teacher. Today, changing careers is expected. Nowadays, the average American worker was projected to change careers at least seven times during their working life. In other words, a teacher might go to work as fundraiser for a nonprofit foundation, or a Fortune 500 business executive might become a college professor. Even when sticking within a single profession, the average person is projected to hold between twelve and fifteen different jobs. Planning for your professional life can be a bit intimidating. Think about it, you are planning for what you hope to be doing 10, 20, maybe 30 years into the future. It is important that you keep an open mind as you go through the process of career planning; do not confine yourself to only one possible career path. Career planning is a lifelong process. As you grow in years, the priorities of your life will likely change, and as your priorities change your interests and desires will likely change as well. The career planning process is comprised of four general components. Self – It is imperative that you know yourself. What are your interests? What are your values? What skills do you possess? In what types of environments are you most productive? What are your developmental needs? In what roles are you most effective? You may think you can easily answer each of these questions, and right now you probably can…for right now, but what about in 10 years? You are going to continue to grow and change throughout your life, so it is important that you be aware of how your answers to these questions change with time. One of the easiest ways to stay aware of how you change, and how your needs change, is through self-assessment. Self-assessments typically include a look at your values, interests, personality, and skills. Options – Once you “know yourself” and have determined the direction in which you wish to take your career it is time to begin identifying the options available to you along that path. You will want to research the industries in which you would like to work as well as the labor market for that industry. This research will give you a better idea of any special education or certification requirements you may need to get into the industry. Additionally, this research can give you a better understanding of how difficult it may be to get into the industry. The higher the demand for properly skilled workers in an industry, the easier it will likely be to land a job. Also, it is always a good idea to take advantage of any opportunities that could give you hands-on experience in the industry such as internships or volunteering. Match – In this phase of the career planning process you should match your skills, interests, and experiences with possible occupations. It is important in this phase that you consider both short- and long-term career goals. As previously stated, your interests and skills will continue to evolve, but it is important that you think beyond just the next couple of years. Identifying a long-term career goal now will help you identify the potential steps between your first job after graduation and your long-term goal. Action – Now you are ready to begin taking steps toward reaching your goal. The action phase of the career planning process is the job search. First, develop a job search strategy. There is no one ideal strategy when it comes to a job search, but the basic components of any strategy should involve: Getting Organized, Locating Job Leads, and Contacting Prospective Employers. Second, you will need to update your resume. If you don’t have a resume, then you will need to write one. See below for resume resources. Third, gather company information. When you are job hunting you will want to learn as much about potential employers as possible. This knowledge will give you a competitive edge and will help when you are evaluating a job offer. Fourth, compose cover letters to go with your resume. A cover letter should provide the reader with the following information: Why you are sending them a resume; explain how you learned about the position or organization, convince the reader to look at your resume; call attention to elements of your background that are relevant to the position you are seeking; reflect your attitude, personality, motivation, and enthusiasm; and provide any information requested in a job posting that might not be covered in your resume. Next, you will need to send cover letters and resumes to the organizations with which you have decided to seek employment. Additionally, at this point you will want to begin preparing for job interviews. See below for interview resources. Take a moment to review the Career Action Plan Worksheet. By completing this worksheet you will begin to build a successful career plan to start your professional life. The projects in this module will assist you in your career development and initial internship and job searches. After completing your selected projects, you are encouraged to take some time to reflect on the projects and how the concepts of career development were applied. Then, share your thoughts and experience with the other Phase III participants and your chapter. The projects for this module are as follows in the listing below. It is recommended that you complete all of the activities in Group A and at least one from Group B. Once you have finished the projects, complete the reflection exercise in preparation for meeting with your Phase III cohort and LEAD Coach/Advisor. It is recommended that you complete all of the following activities. Resume Prep – prepare a resume that can be distributed to potential internship employers. See the primer in this module for resume resources. Interview Practice – learn more about interviews and gain interview experience by participating in a mock interview workshop. Visit your campus’ Career Center for more information and to sign up for a mock interview workshop. Also, check out the Sigma Nu Mentor Network for opportunities to connect with a Sigma Nu alumnus for a practice interview. Visit the Career Center – make an appointment to visit your campus’ Career center for a tour and to understand the resources that are available to you. Take one or more personality or career assessments to help you narrow down your fields of interest. Attend a Job Fair – attend a job fair that is sponsored by your campus or another university during the academic year. Visit your campus’ Career Center for more information and to sign up an upcoming job fair. Informational Interviews – complete an informational interview with a professional in a field you are interested in learning more about. Check out the Sigma Nu Mentor Network for opportunities to connect with a Sigma Nu alumnus for an informational interview. Graduate School Interests – learn about the options available to you by talking to a professor in your department of interest and reviewing web resources for programs at other schools. Medical / Law / Business School Interests – learn about the options available to you and the process of applying by visiting with your academic advisor, a faculty member on your campus, and reviewing online resources. Peace Corps Interests – learn more about the Peace Corps by requesting information and talking with Peace Corps alumni. AmeriCorps Interests – learn more about the AmeriCorps program by requesting information and talking with AmeriCorps alumni. Teach For America Interests – learn more about the Teach For America program by requesting information and talking with Teach for America alumni. LEAD Phase IV - this phase will help with executing your career search and planning for your first year on the job. We’ve all seen it and yet applicants make the same mistakes time and time again. This video warns against the five resume red flags and guides you towards creating a resume that gets results. Video transcript. A cover letter should be a teaser advertisement for the resume, so why do 95% of them say the exact same thing? In this fast-paced lesson, learn what’s wrong with the “typical” cover letter and how to write a short, catchy letter that works. Video transcript. So many companies, so little time to make a lasting impression. In three minutes, learn how to successfully navigate a career fair and make the most out of their company interactions. Video transcript. Perception is reality. Although students may try to fight it, the truth is that dress and appearance can go a long way towards building workplace respect. Discover the essentials of proper interview attire which will ensure a positive first impression. Video transcript. What you do and say online is searchable, and it’s available to anyone worldwide. Learn how to avoid the potential pitfalls that are sinking careers across the country by reviewing some real-life examples from the world’s most popular social network, Facebook. Video transcript. Your performance in an internship can greatly affect your chances of landing a full-time job. In three minutes, get the scoop on internship success – everything from attitude and initiative to professional correspondence and appropriate attire. Video transcript. Students are advised time and time again to network, yet they simply don't do it. The main reasons are that they are intimidated, and they are not entirely sure what to do. In this video, learn a step-by-step plan to network that eliminates all the fear and uncertainty. Video transcript. The terror-inducing, fright-provoking job interview! Some consider an interview as a battle of wits with the recruiting director. This video debunks the myth of the evil recruiting director and shows how to enter an interview relaxed, prepared, and confident. Video transcript. Choosing a career is simple. Choosing a career is an involved process and you should give it the time it deserves. Career planning is a multi-step process that involves learning enough about yourself and the occupations which you are considering to make an informed decision. A career counselor/consultant can tell me what occupation to pick. A career counselor, or any other career development professional, can’t tell you what career is best for you, but they can provide you with guidance in choosing a career and can help facilitate your decision. I can’t make a living from my hobby. Says who? When choosing a career, it makes perfect sense to choose one that is related to what you enjoy doing in your spare time, if you so desire. In addition, people tend to become very skilled in their hobbies, even though most of the skill is gained informally. I should choose a career from a “best careers” list. Every year, especially during milestone years, (e.g. the beginning of a new decade), there are numerous articles and books that list what “the experts” predict will be “hot jobs.” It can’t hurt to look at those lists to see if any of the careers on it appeal to you, but you shouldn’t use the list to dictate your choice. While the predictions are often based on valid data, sometimes things change. Way too often what is hot this year won’t be hot a few years from now. In addition, you need to consider your interests, values, and skills when choosing a career. Just because the outlook for an occupation is good, doesn’t mean that occupation is right for you. Making a lot of money will make me happy. While salary is important, it isn’t the only factor you should look at when choosing a career. Countless surveys have shown that money doesn’t necessarily lead to job satisfaction. For many people, enjoying what they do at work is much more important; however, you should consider earnings, among other things, when evaluating an occupation. Once I choose a career I’ll be stuck in it forever. Not true. If you are unsatisfied in your career for any reason, you can always change it. You’ll be in good company. Many people change careers several times over the course of their lifetimes. If I change careers my skills will go to waste. Your skills are yours to keep. You can take them from one job to another. You may not use them in the exact same way, but they won’t go to waste. If my best friend (or sister, uncle or neighbor) is happy in a particular field, I will be too. Everyone is different and what works for one person won’t necessarily work for another, even if that other person is someone with whom you have a lot in common. If someone you know has a career that interests you, look into it, but be aware of the fact that it may not necessarily be a good fit for you. All I have to do is pick an occupation…things will fall into place after that. Choosing a career is a great start, but there’s a lot more to do after that. A Career Action Plan is a road map that takes you from choosing a career to becoming employed in that occupation to reaching your long-term career goals. There’s very little I can do to learn about an occupation without actually working in it. While firsthand experience is great, there are other ways to explore an occupation. You can read about it online, interview those working in that field, or do an intern- or externship to get a better sense of whether you like or are good at it. DO research the companies in attendance. Business attire or Business casual: Men – nice slacks, button-down shirt or polo-style shirt, or suit and tie; Women – nice slacks or skirt, blouse or sweater. Suit or dress if you wish. Absolutely NO jeans, t-shirts, casual slacks, shorts, sweatshirts, etc. NOTE: This is NOT a job interview. Please respect the employer’s time. Employers will want to visit briefly with many students at the Career Fair. You will make a “good first impression” if you introduce yourself, present your resume, ask one or two relevant questions, and “move on” allowing others to visit the employer. Make personal notes as you go or immediately after the Career Fair. Write yourself a reminder about conversations you had with the company representatives. Did you make any promises to follow up (e.g. send them the link to your website, provide a sample of your work)? Did they mention a special opportunity or suggest someone at their company that you should contact? What “a-ha” moments did you have about your future? What plans do you have in place for the next 12 months that can positively impact the next 12 years of your life? What are your career development goals for the next 12 months? The Social Change Model of Leadership is inclusive, in that it is designed to enhance the development of leadership qualities in all participants – those who hold formal leadership positions as well as those who do not – and to promote a process that is inclusive and actively engages all who wish to contribute. The social change model of leadership and the emerging paradigm of leadership have many similarities. Leadership is viewed as a process rather than a position. The model explicitly promotes the values of equity, social justice, self-knowledge, personal empowerment, collaboration, citizenship, and service. “Service” provides a powerful vehicle for developing student leadership capabilities in a collaborative environment. Learning happens by “making meaning” of life experiences. The model is only one of many possible models of leadership development. It is presented as a working framework that is subject to regular revision and refinement based on the experience of those who use it. Practitioners and students may well find certain elements in the model to be more applicable or relevant than others. Moreover, different types of institutions may need to make some modifications in accordance with their institutional missions. The model has two primary goals: to enhance learning and development. More specifically, to develop in each participant greater: Self-knowledge – understanding of one’s talents, values, and interests, especially as these relate to the student’s capacity to provide effective leadership. Leadership competence – the capacity to mobilize oneself and others to serve and to work collaboratively. To facilitate positive social change at the institution or in the community. That is, to undertake actions which will help the institution/community function more effectively and humanely. The Individual – What personal qualities are we attempting to foster and develop in those who participate in a leadership development program? What personal qualities are most supportive of group functioning and positive social change? 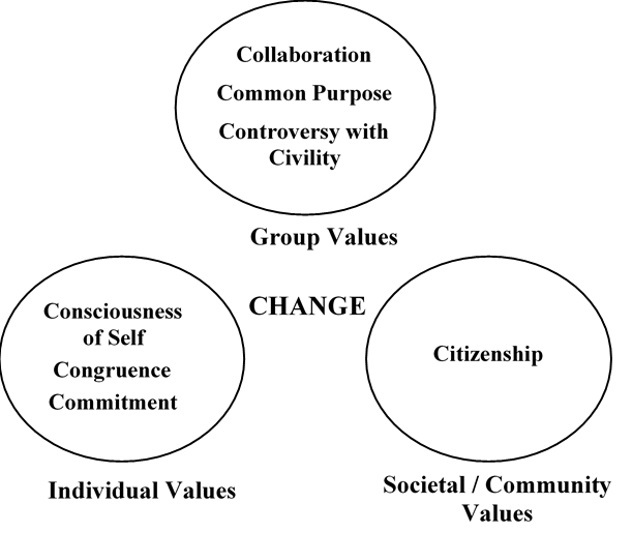 The Group – How can the collaborative leadership development process be designed not only to facilitate the development of the desired individual qualities (above) but also to effect positive social change? The Community/Society – Toward what social ends is the leadership development activity directed? What kinds of service activities are most effective in energizing the group and in developing desired personal qualities in the individual? The connections among these three levels can be illustrated schematically in Figure 1 (below). Arrow “A” indicates that the nature of the group process depends in part on the personal qualities of the individual “leaders” who make up the leadership development group. Arrow “B” symbolizes the reciprocal effect of the group on the individual. Much of what happens in any leadership development effort (and much like a musical ensemble) is that it involves a continuous feedback loop between the group and the individual (a to b to a, etc.). Arrow “C” symbolizes the service activity (“music”), where the group focuses its energies to effect positive change in something outside of itself. Arrow “D” indicates how the outside community (i.e. service recipient or “audience”) responds and will inevitably affect the group process. The feedback loop suggested by arrows “C” and “D” thus symbolizes the byplay between the group and the community that necessarily occurs during any leadership activity that is designed to effect change. Arrow “E” symbolizes the direct engagement of the individual in the service activity. The final arrow, “F”, indicates that the individual can be directly affected by engagement in the change-action project. 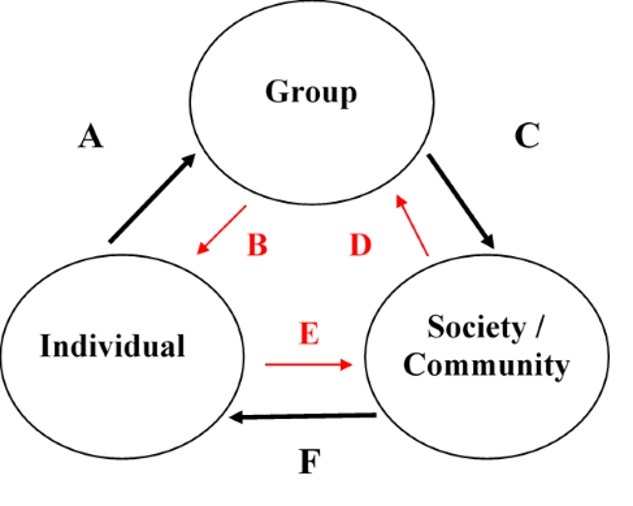 However, some of the most important community feedback to the individual occurs indirectly, where individual students are able to compare their own direct experience of the service activity (arrow “F”) with that of other group members (arrows “D” and “B”). Since it happens that there are seven values in this list and they all begin with the letter “C”, they have been dubbed the “7 C’s” of leadership development for social changes. Change, of course, is the value “hub” which gives meaning and purpose to the 7 C’s. Change, in other words, is the ultimate goal in the creative process of leadership – to make a better world and a better society for self and others. CONSCIOUSNESS OF SELF means being aware of the beliefs, values, attitudes and emotions that motivates one to act. CONGRUENCY refers to thinking, feeling, and behaving with consistency, genuineness, authenticity, and honesty toward others. Congruent persons are those whose actions are consistent with their most deeply held beliefs and convictions. Clearly, personal congruence and consciousness of self are interdependent. COMMITMENT is the psychic energy that motivates the individual to serve and that drives the collective effort. Commitment implies passion, intensity, and duration. It is directed toward both the group activity as well as its intended outcomes. Without commitment, knowledge of self is of little value. And, without adequate knowledge of self, commitment is easily misdirected. Congruence, in turn, is most readily achieved when the person acts with commitment and knowledge of self. COMMON PURPOSE means to work with shared aims and values. It facilitates the group’s ability to engage in collective analysis of the issues at hand and the task to be undertaken. Common purpose is best achieved when all members of the group share in the vision and participate actively in articulating the purpose and goals of the leadership development activity. Recognizing the common purpose and mission of the group helps to generate the high level of trust that any successful collaboration requires. CONTROVERSY WITH CIVILITY recognizes two fundamental realities of any creative group effort – that differences in viewpoint are inevitable, and that such differences must be aired openly but with civility. Civility implies respect for others, a willingness to hear each other is best achieved in a collaborative framework and when a common purpose has been identified. Controversy (conflict, confrontation) can often lead to new, creative solutions to problems, especially when it occurs in an atmosphere of civility, collaboration and common purpose. CITIZENSHIP is the process whereby the individual and the collaborative group become responsibly connected to the community and the society through the leadership development activity. To be a good citizen is to work for positive change on behalf of others and the community. Citizenship thus acknowledges the interdependence of all that are involved in, or affected by, these efforts. It recognizes that the common purpose of the group must incorporate a sense of concern for the rights and welfare of all those who might be affected by the group’s efforts. Good citizenship thus recognizes that effective democracy involves individual responsibility as well as individual rights. In this module you will work as a group of Phase III participants to identify areas of needed change in the community and come up with a plan on how to improve the situation. To have all Phase III participants work together to identify areas of need in their community and develop a plan on how they can improve the situation. What needs are there in your area/community? What groups of people are being left behind and need assistance? What groups are you most interested in helping? What could be done to help that group or segment of society become more self-sufficient? What would that change mean to your community? Once all Phase III participants have identified the needs in your community, work together to brainstorm ideas on how the group can change behavior and improve the situation. Contact an organization that helps the population you are interested in addressing. Meet with them and explain that you would like to work on a special project. Explain to the organization your participation in LAD. Find out more about the organization’s needs and, together, begin working towards positive change. Once you have completed the project, you are encouraged to take some time to reflect on the project your group completed and how the concepts of social change were applied. Share your thoughts and experience with the other Phase III participants and your chapter. What did you learn about the concept of leadership according to the social change model? What strategies worked well in your project? If you had the opportunity to do the project again, what would you do differently? Ethics are abstract and can be difficult to understand; therefore, it is important that you not limit your learning of ethics to what follows. However, the definitions and overview of an “ethics vocabulary” listed here will help you better comprehend ethical concepts and ideas as you continue to grow and learn. In order to think clearly about ethical issues and develop practical approaches for dealing with ethical problems, it is important to speak a common language. Ethics refers to standards of conduct, standards that indicate how one should behave based on moral duties and virtues, which themselves are derived from principles of right and wrong. In order to apply this definition to practical decision-making it is necessary to specify the nature of the moral obligations considered intrinsic to ethical behavior. There are two aspects of ethics. The first involves the ability to discern right from wrong, good from evil, and propriety from impropriety. The second involves the commitment to do what is right, good, and proper. Ethics is an action concept; it is not simply an idea to think and argue about. “Is” versus “Ought” Ethics: Often times discussions about ethics and what is or isn’t ethical veer off into semantic debates about the nature of ethics. Many will argue that ethics are “relative,” “situational,” or “personal.” Such positions usually reveal a misunderstanding of ethics. “Is” (descriptive) ethics describes operational standards of behavior – that is, how an individual or group actually behaves, without reference to what should be. “Is” ethics provide no basis for distinguishing right from wrong. “Ought” (prescriptive or normative) ethics is concerned with discernment of and commitment to principles that establish “norms,” or behavior applicable to every person. Such ethics prescribe how people should behave, prescribing standards for what “ought” to be, without reference to how things actually are. The ideal behavior is based on specific values and principles, which define what is right, good, and proper. These principles will always dictate a single ethically acceptable course of action. Values are core beliefs that guide or motivate attitudes and actions. They also define the things we value and prize the most, and, therefore, provide the basis for ranking the things we want in a way that elevates some values over others. Thus, our values determine how we will behave in certain situations. Values vs. Ethics: The terms “values” and “ethics” are not interchangeable. Ethics is concerned with how a moral person should behave, whereas values simply concern the various beliefs and attitudes that determine how a person actually behaves. Some values concern ethics when they pertain to beliefs as to what is right and wrong. Most values do not. Ethical values directly relate to beliefs concerning what is right and proper – as opposed to what is correct, effective, or desirable. Non-ethical Values: Most of what we value is not concerned with our sense of moral duty but rather with things we like, desire, or find personally important. Wealth, status, happiness, fulfillment, pleasure, personal freedom, being liked, and being respected fall into this category. We call them non-ethical (not unethical) values, for they are ethically neutral. The pursuit of non-ethical objectives is normal and appropriate, so long as ethical values are not sacrificed in the process. Personal Moral Values: Most people have convictions about what is right and wrong based on religious beliefs, cultural roots, family background, personal experiences, laws, organizational values, professional norms, and political habits. These are not the best values to make ethical decisions by, not because they are unimportant, but because they are not universal. In contrast to consensual ethical principles – trustworthiness, respect, responsibility, fairness, caring, citizenship – personal and professional beliefs vary substantially over time, among cultures, and even among members of the same society. They are a source of continuous historical disagreement. Although it is proper for individuals with strong personal and professional moral convictions about right and wrong to treat these beliefs with special reverence, they should be careful about imposing these individual, non-consensus moral values on others. This is an area where, as much as possible, the universal ethical value of respect for others dictates tolerance and respect for the dignity and autonomy of each person and cautions against self-righteousness in areas of legitimate controversy. Personal Moral Systems: Each person has an “operational value system” which reflects how one ranks competing values in deciding how to act. A personal value system encompasses all values – core beliefs and attitudes that guide and motivate behavior – and, therefore, it includes personal convictions about right and wrong, sometimes called “personal moral values.” The fact that everyone has a personal value system that includes opinions and beliefs about what is right and wrong, however, does not mean that ethics is purely a personal matter. Again, ethics – if the term is to have any real meaning – refers to moral norms, how persons should behave according to general moral principles about what is good and right. Values and Principles: When we speak of values, we are referring to broad, general beliefs or attitudes about something we prize or desire. These beliefs, however, guide and motivate ethical conduct only when they are translated into principles. Ethical principles are the rules of conduct that are derived from ethical values. For example, “honesty” is a value that becomes operative in the form of a series of principles: tell the truth, don’t deceive, be candid, don’t cheat. In this way, values give rise to many principles in the form of specific do’s and don’ts. The projects in this module will assist you in understanding ethics. After completing your selected projects, you are encouraged to take some time to reflect on the projects and how the concepts of ethics were applied. Then, share your thoughts and experience with the other Phase III participants and your chapter. There are four project options in this module. You should select two of the four projects to complete. Once you have finished the projects, complete the reflection exercise in preparation for meeting with your Phase III cohort and LEAD Coach/Advisor. Mission Statement & Code of Ethics: Research a company/organization that has a mission and code of ethics and then compose one suitable for your organization if you were the CEO/President. 100 Best Corporate Citizens: Corporate Responsibility Magazine ranks companies based on their commitment to social responsibility and ethics. Contact one of the companies to interview the President/CEO – in person, via phone, or via email – to find out how they shaped the culture of the company. Case Studies: Included are four case studies that focus on the themes of ethics. Review and complete all four case studies by developing your own solutions to the ethical dilemmas that are presented in the cases. Ethics Interview: Interview someone you consider to be an ethical leader to find out their views and insights regarding ethics. Select an organization/industry you are interested in researching. Look up the organization’s website to find their mission statement and code of ethics. If you can’t find their mission or code of ethics, call the company and ask for this material as well as a copy of their annual report. Review the mission statement and code of ethics to answer the following questions. Does the mission describe an inspiring purpose that avoids playing to the selfish interests of stakeholders? Does the mission or code of ethics describe the organization’s responsibility to it stakeholders/customers/community? Does the mission define a value proposition for the organization? Does the mission or code of ethics identify values that link to the organization’s purpose and act as beliefs with which members/employees can feel proud? Do the values indicated in the mission/code of ethics resonate and reinforce the organization’s purpose and strategy? Do the mission/ethics describe important behavior standards for the organization and its members/employees? Is the mission/code of ethics easy to read and understand? Write a mission statement and/or code of ethics for an organization you belong to, or a fictitious organization, as if you were the organization’s CEO/President. To learn how ethics can positively impact an organization. Corporate Responsibility Magazine ranks the top 100 Best Corporate Citizens each year. Go to their website http://www.3blassociation.com/recognition/100-best-corporate-citizens to review this or a recent year’s listing. Select a company from the list that you are interested in learning more about. Once you have selected a company, look up the contact information for one of the company’s officers (preferably the CEO, or another representative if an especially large company) on their website. Call to set up a 15-minute telephone conversation with the CEO (or other company officer). Identify yourself, explain that you are participating in a leadership development program and you understand that they were recognized as one of the 100 Best Corporate Citizens by Corporate Responsibility Magazine. Tell them that you would like to ask some questions about the culture within their company and how they believe they created an environment focused on ethical behavior. Review the suggested questions from below and prepare 3-5 of your own questions as well. Call the CEO or company officer at the agreed upon time. If the CEO or company officer is not available for a phone interview, determine if it would be plausible for you to email your questions for them to respond to. Send the CEO/officer a thank-you note within 48 hours of the interview. Your company was listed as one of the 100 best corporate citizens. What do you attribute this to? How do you define accountability? How have you built a culture of accountability in your organization? How has accountability helped build a culture that focuses on doing the right thing? What is mentioned about ethics when you interview prospective employees? What does ethical behavior mean to you? How does having a culture of good ethical behavior help your company? What are some of the challenges you’ve faced in building a culture based on ethical behavior? To understand how you would act in a situation involving an ethical dilemma. Review the four (4) case studies that follow. Answer the case study questions at the end of each case. Be prepared to share the basics of each case study and your responses to the questions when you next meet with your Phase III cohort. Bill Church was in a bind. A recent graduate of a prestigious business school, he had taken a job in the accounting division of Greenspan & Co., a fast-growing leader in the accounting industry. Greenspan relocated Bill, his wife, and their one-year old daughter from the Midwest to the East Coast. On arriving, they bought their first home and a second car. Bill was told that the company had big plans for him; therefore, he did not worry about being financially overextended. Several months into the job, Bill found he was working late into the night to complete his auditing assignments. He realized that the company did not want its clients billed for excessive hours and that he needed to become more efficient if he wanted to move up in the company. He asked one of his friends, Ann, how she managed to be so efficient in auditing client records. “I don’t understand,” said Bill. Bill realized that “eating time” meant not reporting all the hours required to complete a project. He also remembered one of Reed’s classic phrases, “results, results, results.” He thanked Ann for her input and went back to work. Bill thought of going over Reed’s head and asking for advice from the Division Manager, but he had met her only once and did not know anything about her. Describe the process that Bill will use to attempt to resolve his dilemma. If anyone were hurt by his action, it would seem to be young accountants, who are expected to work long hours. Why is this an ethical problem? Terri Benson was a senior in the Engineering Program of Andersonville College. She had been a marginal student since she entered Andersonville. She had been on probation twice and had to take one semester off. She was still in danger of not finishing. In addition to her marginal GPA, she still had two required courses to complete in her major. She was not doing well. Not only that, but she had been accused of cheating on the midterm exam. There seemed to be little doubt that she was guilty. The responses on her answer sheet, even the wrong answers, exactly matched those of the person who was seated directly in front of her. The probability that two students could produce an identical set of wrong answers on ten different items was close to zero. Moreover, given their positions in the room, it was virtually impossible that the other student could have copied from Terri. Professor Ames, the instructor, prided himself on his firm sense of academic honesty. Thus, he decided to charge Terri with violating the college’s academic integrity code, although he wasn’t required to do so. Because Terri wasn’t exactly a model student, it also seemed important to him to protect the engineering profession from someone who wouldn’t bring credit to it. Andersonville College had a committee on academic integrity. A student accused of cheating had to be charged before the committee by the instructor of the course in which the alleged cheating took place. The committee would then consider the evidence, make a judgment, and, if the student was found guilty, decide on a penalty. This semester, the academic integrity committee was chaired by Professor Bloom, who had a reputation for fairness unburdened by mercy. Professor Ames made a persuasive case against Terri. She admitted her guilt and excused herself by saying that she had panicked because she was afraid that if she failed the exam, she wouldn’t be able to complete the program. She still hoped to enter the Master of Engineering program at Andersonville. She was afraid that failing Ames’ course would doom her admission. The committee then sent her out of the room while they discussed the verdict. Professor Bloom says that intellectual honesty is the central value sustaining a college community. Why might this be? What are some of the other values that might be similarly important? If Terri’s description of her education is accurate, has the engineering faculty of Andersonville also failed to show academic integrity? Do you think this is how students are treated at your college or university? What could be done to create a stronger sense of community? Some institutions have an honor code in which students promise not to cheat and also promise not to tolerate cheating in others. Would such a code work at your school? Why or why not? Is it possible to create an academic moral climate that would make students not want to cheat? How? What values would be essential? Many students often sympathize with those who cheat. Even if they don’ exactly approve of cheating, students rarely turn in, or even criticize, those who cheat. Should they? In many situations, loyalties to friends or solidarity with members of one’s group are important virtues. Are they in cases of cheating? How do you see your responsibilities here? Terri’s last reaction to Professor Bloom seems common in real-life ethical discussion. She accused him of inconsistency because he and his colleagues seem to violate the same values they blame her for violating. Is Terri’s claim that she just copied the faculty’s example plausible? Another common defense for some kinds of unethical behavior is that they don’t really harm anyone. Does cheating harm anyone? If so, whom and how? Jerry’s parents divorced bitterly while he was in tenth grade. It was a wrenching experience, not least because his parents used him as the chief prize in their war with each other. Even after the divorce, they constantly pressured him to take sides, and they generally made him miserable without (apparently) meaning to. He survived by retreating from both of them, throwing himself into his schoolwork and his music, and longing for the day he could escape. Jerry is finally living away from home in a freshman dorm, but his parents’ battles seem to have followed him to college. Their latest fight is over who will pay for his college education. When Jerry was applying to schools, his dad promised to pay Jerry’s tuition if he was accepted to the largest state university. Now that Jerry has made it, his Dad is refusing to pay for another semester. The reason is that Jerry’s mom is planning to remarry, and Jerry’s father sarcastically insists that if she does, his “new dad” can foot the bill for school. Unfortunately, his future stepfather has made it clear the he will not pay for Jerry’s college and his mother can’t pay for the tuition herself. Jerry is not eligible for financial aid because he has never lived independently, and his parents’ income bracket disqualified him as their dependent. Thus, it seems that Jerry will have to drop out of school. If he can afford college at all on what he can earn from a part-time job, he will have to settle for the local community college and move back in with his mom or dad. That is, unless he can get one of his parents to change their mind. Should Jerry try to influence his father to pay for his college in spite of his mother’s remarriage? Should his mother try to get her new husband to pay? Should she postpone her wedding so that his father will keep paying? Does Jerry have an equal duty to both of his parents in this situation? How can he (or anyone) respond ethically to manipulation by loved ones? What would you do if you were Jerry? How might the principles of relationships, character growth and benefit maximization apply to this case? After three years with the company, Sandy was promoted to assistant plant manager. This was a big step for Unity Welding and Construction, as well as for the industry. Sandy was one of only a handful of women who had broken through the “glass ceiling” and made her way into management. She had proved to the men around her that she deserved the job and was now being toasted by assistant managers from other plants across the country. John, her boss, had been her advocate with the company. He had personally lobbied upper management on her behalf. Unity Welding and Construction is a national firm with twenty fabrication plants, primarily in the South. The company does contract work for other companies that require welding or fabrication of metals into items used in the construction of aircraft, ships, bridges and component parts for consumer durables. Each plant caters to specific industries. Sandy’s plant produces parts primarily for the automotive industry and is located in Arizona. Arizona is perfect for Sandy because of her acute asthma problems. As a teenager, she once visited relatives in Atlanta and had to be hospitalized because of her reactions to different plants and foliage. Sandy’s doctor told her at the time that she would have fewer problems with her asthma if she resided in one of the arid regions of the United States. Six months had passed since Sandy’s promotion, and her first performance rating from John was excellent. John told her that if she continued this type of performance, she would probably be plant manager in three to six years. Sandy developed some innovative ways to increase productivity on the job. For example, she successfully implemented a “team concept” that gave responsibility for certain projects to the workers on the plant floor. She offered incentives if they could decrease job times and increases profitability. John gave Sandy his full support, and the program was working well. Worker salaries on these special projects jumped from an average of $15 per hour to $24 per hour, yet the company’s bottom line continued to improve. Workers in the plant began competing to get on special projects. It has come to management’s attention that minor injuries are on the rise. Please review the Occupational Safety and Health Administration guidelines to make sure you are in compliance. In addition, there are rumors of improper disposal of wastes. Please read again the statement from the EPA. Finally, congrats to Special Project Team Wolf. Profitability on your job increased 8 percent with an increase of $4.50 an hour for each member of the group. Great job! Shortly after John sent out his memo, the recession started to hit the automobile industry. Some of Sandy’s workers were to be laid off. Sandy went through the records and found that her most productive workers had been selected for termination. She went to John with the problem and he said he would take care of it. By calling in some favors, John was able to save the workers’ jobs and no pink slips were issued at the plant. Within a week, the workers knew John and Sandy had saved them. Two months later, in November, the special project teams were working especially hard. Sandy noticed that the teams with the highest hourly wages were also the ones that were cutting corners the most. Sandy ran a spot inspection and found major quality problems with the products, as well as pollution problems. Additionally, she learned that several teams had “procured” software from the competition to reduce their production times. Sandy realized that something needed to be done quickly, so she went to John. “So, I’ll tell you what you’re going to do. Sandy, you’re going to forget about OSHA, the EPA, and the software and you’re going to ‘doctor up’ the quality control reports. If you don’t, we’re both out of jobs. Have you ever tried getting a job in a recession? When the recession is over, we’ll straighten things out,” said John. Discuss Sandy’s options relative to the situation. What factors are affecting Sandy’s options? Discuss John’s behavior relative to the situation. What information is missing that could help your decision? To gain a greater understanding of ethics and how they affect your field of study/interest. Identify someone on your campus or local community that you believe is an ethical leader. This should be someone either in your field of study or an area of interest for future employment or service. Email the person to set up a time for the interview. In your email, tell them about LEAD and that you’d like to interview them about ethics in their profession. Set a time and date for the interview. Review the list of suggested interview questions from below. Add some of your own questions. Re-confirm your interview date and time two days prior to the meeting. Be prepared and dressed appropriately for the interview. Send a thank-you note within 48 hours of the interview. What does the term “ethics” mean to you? How do you feel you live an ethical life? What are some of the challenges related to ethics that you have faced in your personal life? How has your focus on ethics helped you personally? Professionally? What do you think could be done to help develop college students who are more focused on living an ethical life? What decision-making process do you use in ethical dilemmas? What does your organization/company do to promote ethical decision-making? What did you learn about ethics? What do you think are the most important components to a code of ethics? We face problems every day throughout life. Being an effective problem solver is a notable skill that will serve you well not only today but well after graduation. What follows are six steps for problem solving identified by Edward de Bono in his book, The Six Thinking Hats. Many problem-solving efforts have gone off-track because those involved didn’t take the time to define the problem. With a problem clearly defined, a group can focus on the task at hand of working through the process. The best was to make sure a problem is understood is to put it in writing. Develop a problem statement (Example: Our chapter membership has declined from 55 to 31 in the past three years). Identify a “desired state” or goal (Example: The chapter membership will increase by 20% each year for the next four consecutive years). Is the problem stated objectively? Is it stated in a way that it doesn’t slant the situation in favor of one approach or another? Is should be a simple statement of fact. Is the problem limited in scope? The problem should be defined so that it is small enough for a team or an individual to realistically tackle and solve. Does everyone involved have a common understanding of the problem? It should be written in a way that everyone can understand it. The “desired state” is where you want to be when the problem is solved. Defining the desired state, or goal, provides focus and direction. A measurable goal makes it possible to track progress as the problem is being solved. Identify Potential Causes – identify all potential causes that are contributing to the problem. Develop a list of 10-15 of the most likely causes. Identify the Root Cause(s) – one of the vital actions is the need to look beyond the symptoms of a problem to get to the real, or “root,” causes. Once the causes of the problem have been identified, it is important to generate ideas and alternatives for solving the problem. This is the stage in the problem-solving process that requires the maximum level of creativity. Determine the best solutions. You can narrow your list of initial ideas by multi-voting. Write all the possible solutions on a flipchart. Give each member of your group 5 votes to distribute among the list of ideas that were generated. Have them mark the ideas they think are the best possible solutions with a check. When all members are done, tally the number of checks next to each idea. The ideas with the most checks are the possible solutions your group believes in. During step four, a decision must be made on which solutions to choose. As with any decision, several factors enter the process. In many problem-solving situations, the different factors or criteria that individuals use to make their decisions are unclear or never voiced. This can lead to misunderstandings. The following steps will help ensure that you and your team reach an agreement and select the best solutions for your problem. The first key in this process is to put all the criteria people are considering out in the open and on the table. At this point, all the members are not clear on the criteria that others are using. The second key is for the team to agree on how important these criteria are in relation to each other. There might be a certain criterion that is much more important to the group. This should be weighted higher than other criteria. To do this, determine which criteria (3-6) are most important for selecting a solution to the problem. Make sure that you can clearly define each criterion so that everyone has the same definition in mind. Applying the weightings to each criterion show how important they are, relative to each other. This can be done by assigning a number to each criterion so all the criteria together total 100. Now, apply the criteria to each of the solutions in your list of 4-6 possible solutions. When you are done, multiply the scores for each solution by the weight that you assigned for each criterion. This should help you identify and select the best solution. Divide the solution into sequential tasks. What tasks or activities need to be carried out to implement the solution? Who will be responsible for each and what are the target dates to have their tasks completed? Develop a backup plan. What strategies will you use as a backup plan? You should be prepared to modify your action plan as necessary. It is important to realize that circumstances, situations, people, and preferences can change over time. By tracking the implementation of the action plan and evaluating progress, you can ensure the solutions are implemented even with those types of changes. The following sub-steps will make this stage of problem-solving work for you. Collect data according to the action plan. It is important that you have a process in place for monitoring the plan. This could include weekly reports from key members or officers, or meetings with key people on a regular basis. What data will you collect to ensure that the action steps have been completed? How will you collect it? Implement backup plans. As things change during the implementation of the plan, you need to be ready to adjust. What is your approach for implementing the backup plan? Evaluate results. How have things gone? Are there plans in place to ensure the problem does not occur again? The projects in this module will assist you in the development of your problem-solving skills. After completing your selected projects, you are encouraged to take some time to reflect on the projects and how the concepts of problem-solving were applied. Then, share your thoughts and experience with the other Phase III participants and your chapter. Lead a Problem-Solving Initiative: Select an organization that you belong to and partner with other organization members to identify a problem issue. Work through the problem-solving steps throughout the semester/quarter. Facilitate a Workshop on Problem-Solving: Using the primer information from this module and the resources listed below, facilitate a problem-solving workshop for a student organization on campus. Apollo 13: Analyze the movie Apollo 13 to identify the steps the characters used in dealing with their problem. Analyze a Problem-Solving Initiative: Analyze a problem-solving initiative in a campus or community organization. To become familiar and comfortable with effective problem-solving techniques while positively affecting an organization to which you belong. Identify an organization you belong to that you would like to work with. Identify some of the problems facing the organization. Get some ideas from other members of the organization. Present the problem and solution to the organization. Continue to evaluate the progress and effectiveness of your solution(s). To become familiar and comfortable with effective problem-solving techniques while positively affecting a student organization. Identify an organization that is interested in having you facilitate a workshop on problem-solving. Contact friends who are officers in other student organizations or meet with the Director of Student Activities on your campus to identify an organization to work with. Meet with the organization’s president and tell them about the workshop and what the organization will gain from it. Set up the time, date, and location of the workshop. Ensure that you have the proper materials (e.g. flipchart, markers, pens, problem solving worksheets handout, etc.) to facilitate the workshop. Prepare for the workshop. It is recommended that you spend 1-2 hours going over the facilitation notes, handouts, and any activities you’ll be using. To evaluate problem-solving techniques and strategies identified in the movie Apollo 13. Rent and watch the movie Apollo 13. After watching the movie, identify the problem-solving strategies the characters in the movie used to solve the problems and challenges they faced (see evaluation questions below). Discuss your evaluation with the other LEAD Phase III participants. In answering the questions that follow, treat the main plot of the movie – landing the injured spacecraft – as the problem to be solved. Did the characters in the movie progress through the six-step problem-solving process (Define the Problem; Analyze the Causes; Identify Possible Solutions; Choose a Solution; Develop an Action Plan; Implement Solutions and Evaluate Progress)? If so, identify how they addressed each step. If not, what step(s) did they skip? How did this affect the situation? How many people/characters were involved in the problem-solving process? Do you think there were too many people involved? Not enough? What were some other possible solutions to the problem(s) faced by the characters? Did the characters have to adapt their initial solution(s)? If so, how did they adjust their plan(s)? To evaluate problem-solving techniques utilized in another campus or community organization. Identify a problem-solving initiative that is taking place on campus or in the community. This could involve a campus organization, an administrative office on campus, or an organization in the community. Learn as much about the problem as possibly by reading news articles and doing online research. Make an appointment to meet with the staff person or an officer in the organization to learn about the problem initiative and interview them. During the interview, you should ask the questions listed below (feel free to add 3-5 questions of your own as well). Type up a summary of the situation and be prepared to share it and your recommendation at the next meeting of LEAD Phase III participants. What is the purpose of your organization? What is the background of your organization? What is the problem initiative you are working on? Why is there a need to solve the problem? What has the organization done to work on the problem? What have other similar groups done to deal with this problem? What did you learn about the concept of problem-solving from evaluating this organization? What strategies appear to have worked well for the organization? What did you learn about the concept of problem-solving from this initiative?